‘What do you do all day! except washing utensils and cooking whatever groceries your husband brings home’ asked a relative some time back. Note the contempt. It was said with a sneer even. ‘Nothing! I just sit around all day, read books, watch TV and eat ready meals heated in the microwave’ was my retort or something like that. After all I am just a housewife. It is a falsity universally acknowledged that a housewife or a stay at home mom has no work and just sits around all day being lazy and making merry. The working woman is the one who does all the work at office and at home! The housewife should in fact be ashamed to stay at home and be a burden on her husband – as he has to work hard to provide for her. For the work of the housewife cannot be seen, evaluated and appraised. She doesn’t get a pay check at the end of the month to prove she’s done any work. The house is always clean – the rooms, furniture, upholstery are cleansing agents – they clean themselves. They do not need a person dusting, washing and swiping at them. The delicious food gets cooked automatically and magically finds itself served hot on the table. Three times a day. The clothes, when spoiled, find their way to the washing machine and when the machine is done, go and hang themselves on the stand. What’s more, when they are all dry they walk up to the closet and fold themselves neatly in the shelves; some of them even place themselves on ironing stands and get themselves ironed – again to walk into the closets in neat folds. The groceries are automatically replenished. Perhaps the refrigerator has a mechanism with the superstore to refill the items. The trash – when it finds itself stinking unbearably walks out into the trash-cans outside the building. If you are in India, the door is automatically answered 20 times a day for salesman, postman, neighbours, watchman, sundry people and their requirements are answered. The phone is answered by an operator. The small baby in the house dresses, feeds and cleans himself without any help from the adult. Or perhaps the fairy mother takes care of the child and looks after his needs. The kids raise themselves with good values, discipline and nutrition. If the child has good values, is well-behaved, obedient and generally a good boy all around – then it must be his inherent nature and he is born with it – the stay at home mom has no influence or contribution in it at all. Note that if you are living abroad, the maid, servant, driver, etc. 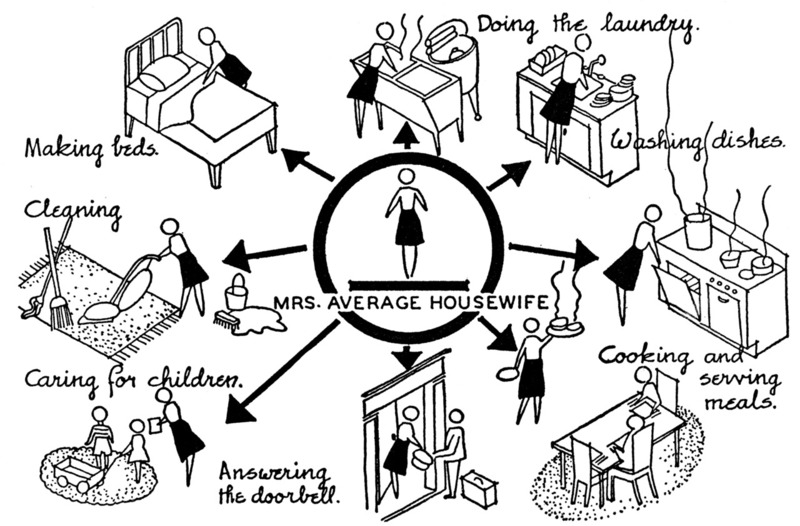 is all rolled into one person – the housewife. There is no maid to do your daily chores of washing the dishes and clothes. You have to do your own groceries shopping and carry them from the shop to your house. So then what do housewives have to crib about? Today if a woman chooses to stay home it is usually because she has the option and wants to care for her children. The fact that despite being well-educated and worked hard enough to make a career, these women have made a conscious and rational decision to give up their jobs to take care of their children, I think such women should be respected for their choices. This entry was posted in Edinburgh, personal, rants and tagged family, home, Housekeeping, Housewife, rant on April 16, 2012 by Maddie. Homemakers deserve every bit of respect for the hard work they put in, in doing what they do so lovingly and wonderfully. No one has a right to judge other people’s life, lifestyle and personal choices. I agree…and people are most often quick to judge and pass remarks rather than think and appreciate. To each his own…what others do in their life has got nothing to do with you and has no bearing on your life. Lol…loved your post. Can I just say though…I think you are damned if you do and damned if you don’t. Even women who choose to work after having kids are judged as being too career-oriented, not caring enough for the family etc etc. And well, you’ve highlighted the judgements against the housewives pretty well. Basically, there’s no win! And all the judgement surprisingly comes mostly from other women!!! I so agree PB…damned if you do and damned if you don’t. And yes the judgement comes from women mostly even in this case I mentioned. Nice piece. But then again, my problem is not with working women, I was one of them until recently and I will most probably work again. I get upset and angry with people who think housewives have no work. Very true! If a women chooses not to work people call her women of leisure – Yeah they do all leisure activities of cleaning every corner of the rooms, toilets, tub and sinks, cleaning the vessels, cooking delicious food and doing shopping. There’s often no “Me time” for her particularly if she is raising a kid. I agree about the no ‘Me time’ but everyone should try to spend some time alone each day to remain sane. I don’t know why housewives get offended when someone asks them, ‘Are you a housewife?’. People may not mean something bad, but some housewives do take that question as an insult! I think its time to come out of their own assumptions and look at the question rationally. One might just want information and it might just be a way to greet! I have no problems with people who just want information. That is okay. What gets my guts is when they look down upon it and consider it inferior. Its venting out season for the housewives, looks like, just this morning read a blog post here on http://www.purba-ray.com/2012/04/dilemma-of-sahm.html which dealt with similar stuff. Being a housewife is the most thankless job in the world and its high time husbands start realizing that, if not anyone else. Yes…it’s work 24×7 with no leaves and holidays! Ur views r absolutely correct and should serve as an eye opener to people having extremely opposite feelings. May be I also have to take a lesson. Thanks keep writing. I so so loved your post..esp the part about if the kids are well-behaved it’s their inherent nature and the mother has nothing to do with it.. Thanks Amit! 🙂 Still don’t know who tipped Blogadda with my post. Just cannot agree more with you!! Agreed A house-maker, Housewife or a stay at home Mom is mostly taken for granted!! This is the world’s most THANKLESS job… Well said n v truly said!! I hear you…and I have heard that line many times…What does she have to complain about, she is at home only na..
Hey Maddie! I think this is one of the best blog of yours, i really agree each & every word you have written. In fact I have always appreciated my Aai for being a housewife. Literally it’s 24 X 7 thankless job & I really admire all of them who are doing it. Thanks Mruneshda! It is a thankless job! Hi Maddie, I hopped in here through Parentous, and loved your post. It was hilarious. I don’t cook the main meals and yet I find enough chores to keep myself completely occupied the whole day. Sometimes when I get slight backache, I realise I haven’t sat for a while, and then sit down to relax a bit. 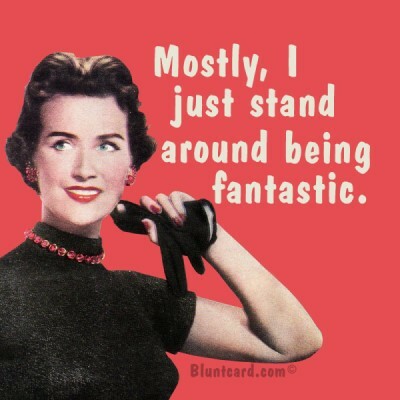 And yet, sometimes when somebody calls up or asks ‘what were you doing?’, I blurt ‘nothing’. You know, somehow it has creeped into our though process that this whole work we do, does not mean ‘something worthwhile’. I don’t know if it happens with you. I wrote this post in a fit of anger but now when I read it I can’t stop laughing. It is just that these chores are considered to be part of women’s inherent duties. We don’t have anything to show to the world. And absolutely it is not considered worthwhile. It bugs me no end. Here’s a different perspective. Some working women have to manage home as well as work and sometimes this frustration is translated into putting home makers down. However, if you are a working woman who is happy in her career, then there would be no requirement to put someone else down. Maybe, they are working not because they want to, but because they are compelled to. If a woman was working out of choice and happy with the shape her career is taking, there would be no need to draw any comparisons. Take heart. Maybe they try to cover up their own frustrations and unhappiness with their status quo by putting home makers down. Couldn’t be happier to read something like this! The last lines were the icing on the cake. They do it because they WANT to and they’re happy with it also.